You just found the best place to write and share rap songs online. 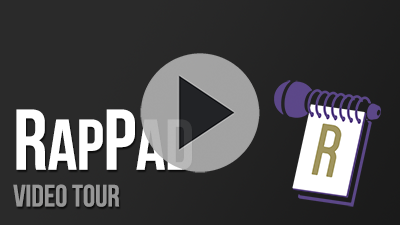 RapPad is a social network for rappers, producers, and hip hop enthusiasts. We provide the best tools to help our members create and discover dope music. RapPad combines a bunch of language tools that help you analyze and write lyrics like never before. There is a built-in rhyming dictionary, syllable counter, thesaurus, line generator, and much more. You can also attach an instrumental or recording to your lyrics and control it from the same interface. Once you think you have what it takes you can battle other members on the site. You can choose a specific member or request someone to challenge you. You can also specify rules and limits on the length of the battle. Once the battle begins, other members can vote for who wins. Ditch the pen and paper - you'll never lose your work again. All the lyrics you write on RapPad can be exported in one click and you always control who can view your songs with different privacy settings. The Blueprint™ breaks down your lyrics into syllables and gives you insight about metrics like rhyme density, the complexity of rhymes, and average syllables per word. It then uses these metrics to give your rap an overall grade. Artists use RapPad to share their music, whether it's recorded or written. You can sync your lyrics with your song (beat or recording) so the words are highlighted as the beat plays. Whether you participate in the weekly cypher, or discuss hip hop with other members, everything you do on RapPad gives you reputation points which is shown in your profile. You can also earn trophies over time. The freestyle section allows you to specify a time interval to be shown a random topic. A continuous stream of beats also play in the background so you can practice spitting raps off the top of your head. You can also put it on the big screen in full screen mode. Sign Up In 5 Seconds!